As I mentioned in the latest Dev Update, we've made some changes to the House system as well as the individual background lore behind each one. Before sharing those changes, I'm interested in which one your gut or thinking has led you to think might need a change? And if you care to share why (or you have more that one choice since the poll only lets you vote once), let's hear it! Resolute - I hold strong in my beliefs that this is the one I am planning to join, but my problems with Ronin kind of apply to this one as well. Ronin - To broad of a subject group, kind of encompasses all of the other houses, and all of the other houses can have Ronins in them. Profit - Greed concurs all! I don't like 2-2-2. If I had it my way it would be 1-3-2. Resolute - I like the theme and the name fits an "order" House. I imagine high walls and soldiers in a phalanx defending them. Secrecy - Not terribly secret if it's in the name. Revenge - A bit on the nose name wise, but I can see a House built on the theme of "an eye-for-an-eye" working still. Majesty - I like the idea of the house, and I'm not even sure what I would change the name to if we're being honest. I just, don't like the name that much. If I had to move one into the "not changing" category it would be this one. Profit - I never like this House idea in the first place. Everyone wants to profit to some degree. It needs to be reworked into something like the East India Trading Company. Ronin - With the system change to having to be in a guild to be in a House, the lone wolf idea of Ronin no longer makes any sense. Sadly, I seem to have missed a fair amount of background/lore. I am basis this off of the names alone. The current naming scheme feels a bit... Pokemon to me, just a lot more on the nose. They do a good job of conveying the goals of the house. I would rather they change to be less direct. Rename all of the houses to be based off of "founder" NPC characters. As examples (using NPC names I found when skimming the dev updates, dang I missed a lot). House Zaan, founder Archmage Edyrin Zaan. House Manigold, founder Elle Manigold. House Dumari, founder Kora Dumari. 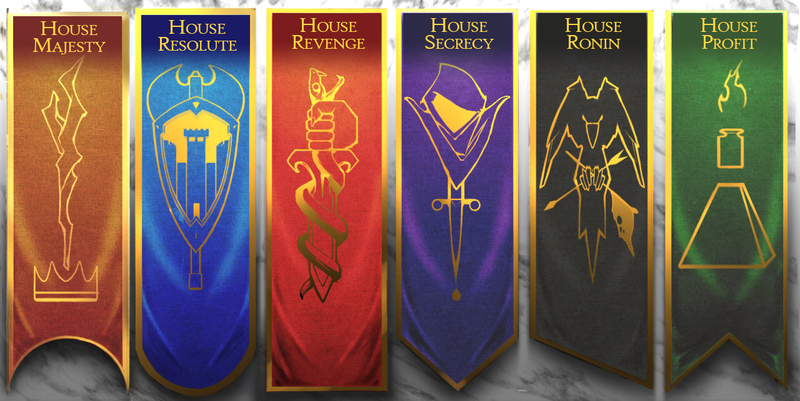 Houses could also be named after the zones that house them. House Revenge could become house Askala. For each house, identify the core "tenets" that make up the values of the house. Majesty - sounds great already, lore heavy. Resolute- sounds like a solid house and concept. Secrecy - Similar to what others have said, something more universal and less rogue-centric looking/sounding. It could still be shadowy and sneaky though. Maybe something similar to the dark brotherhood in Skyrim. House Veil, Shadow, etc. Revenge- I like revenge conceptually and think it will still have a similar vibe as a more aggressive house. This name could be anything lore based or tonally agro. This is more of my opinion fwiw (probably not much) and less of a complete shot in the dark. 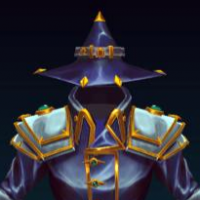 Profit - Change the color from green to gold (and change the name to something lore based) someone above mentioned “fortune” or maybe “opulence”. Ronin - switch the Black with Profit’s green and go more of a nature-y route. Something more connected to the flora/fauna of Embermark. Why I chose Ronin over Profit for the sake of this poll. I believe a black bannered house will be undoubtedly the most popular- by far. The contrarian in me would avoid it for that reason. Having players choose (or not) between orange, blue, green, gold, purple, and red banners is more interesting than selecting the obviously cool black banner. My favorite banner is the Ronin banner but I agree with an above post that it may become the most popular banner just by looks. I also like the idea of naming it after an NPC character. You can still theme the banners based on the personality or actions of certain NPC families. The House Profit is my least favorite name and picture currently. I do think a Greedy NPC for a guild leader is a good idea for a theme though.